What if you could get the very best marketing ideas as soon as your favorite marketing expert has them? Imagine having a high-octane idea feed like that available for you to brainstorm on what to do next to grow your online business. Wouldn’t it be seriously valuable? Let me explain how I accomplish just exactly that to grow my own online businesses. I subscribe to not quite 300 different marketing blogs from all the very best Marketing Masters. On top of that, I am constantly Googling and reading scores of in-depth articles when I get interested in particular topics. It’s pretty simple. As I encounter information by reading the blogs I follow or researching my topics, I scan the articles for valuable nuggets. I extract these and save them in a big spreadsheet I call my “Idea Bank”. I explain a lot more about how I use my Idea Banks in my free online productivity hacks training, which you can get just by signing up for my weekly blog newsletter. You can have access to my refined high octane feed for your own uses. 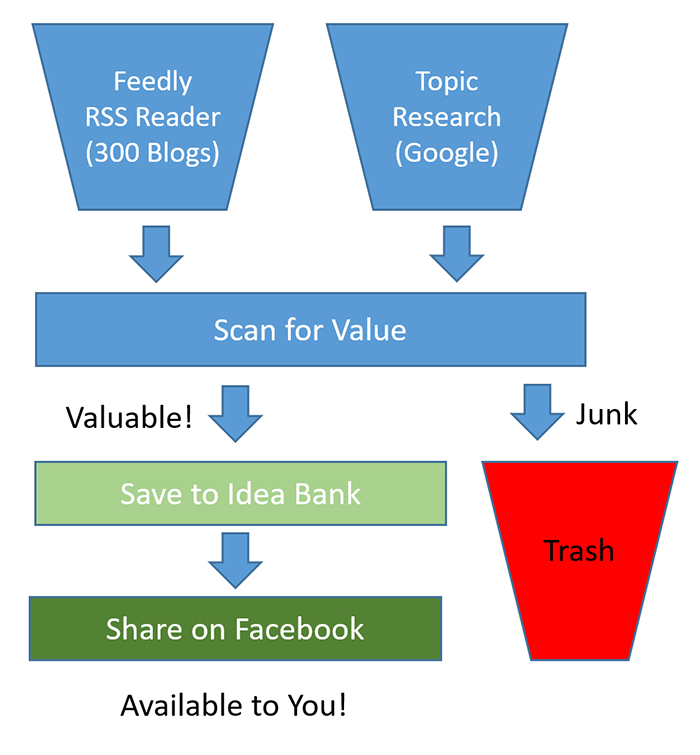 That’s right, I will share every article that stimulated me to add a new entry to my Idea Bank. You can read them all and pick and choose what sounds useful for your needs. You can’t get these ideas elsewhere, so be sure and click and follow the page. Drop in there from time to time to see what’s up. The more of them you like or share, the more likely they will show up in your regular Facebook newsfeed too. I spend a lot of time going through all of this information, so this Facebook feed will save you a ton of effort. Go ahead, click through and follow now!